Lucy Ann Sotak (harp), 10, is from Arvada, Colorado. She studies music with Mary Kay Waddington. 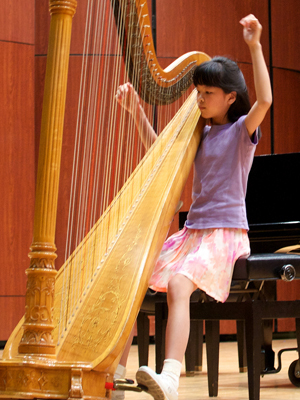 Lucy was developed an interest in the harp through her mother, who is also a harpist. In 2011, she played in a harp ensemble of 20 harpists in The World Harp Congress in Vancouver, Canada. She has participated in Peaks to Plains Suzuki Institute and performed in the Suzuki AssociationÕs 40th Anniversary Concert. Outside of music, Lucy loves bird watching and learning about birds and she loves seeing new birds at her birdfeeder.